After a long absence, volatility returned to the equity market this past quarter. In our previous quarterly commentary “The Flip Side” we wrote “The S&P 500 closed 2017 with its 14th consecutive positive month. 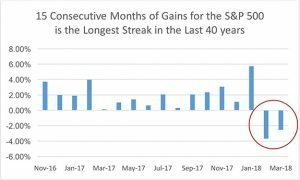 This is the longest monthly winning streak for the S&P 500 in the last 40 years.” That streak did extend to a fifteenth month in January 2018, although it did end in February of 2018. A snipe hunt is a type of practical joke, in existence in North America as early as the 1840s, in which an unsuspecting newcomer is duped into trying to catch a non-existent animal called a snipe. While snipe are an actual family of birds, the snipe hunt is a quest for an imaginary creature whose description varies. The target of the prank is led to an outdoor spot and given instructions for catching the snipe; these often include waiting in the dark and holding an empty bag or making noises to attract the prey. The others involved in the prank then leave the newcomer alone in the woods to discover the joke. As an American rite of passage, snipe hunting is often associated with summer camps and groups such as the Boy Scouts. Over the year and a half ending December 31, 2017 there were only 18 ‘volatile’ days (days in which the S&P 500 moved up or down 1% or more). In Q1 2018 volatility returned and we saw a total of 23 volatile days in the quarter. In the last quarter of 2017 there were zero volatile days. While we’ve been defensively-minded for some time, the recent lack of volatility in a long-lived bull market has given us further pause: are investors so accustomed to winning that they have forgotten what losing feels like? We view volatility not as risk, but as opportunity – a favorable time to use cash to add to individual positions that we already own and have become more attractive or the opportunity to initiate new positions in company’s we have on our watch list. The return of volatility to the market in the first quarter gave us just that opportunity as you will in the section below. During the first quarter of 2018 we sold out of 2 positions and added 2 new positions to the Fund’s portfolio. During the first quarter of 2018 we added Anheuser-Busch InBev (BUD, 2.43% of Fund assets as of 3/31/18) and Howard Hughes Corp. (1.19% of Fund Assets). We sold our position in Jones Lang LaSalle, Inc. and VF Corp. The Fund’s cash position (cash and cash equivalents) on March 31, 2018 was 33.19%, slightly lower than where we ended the prior quarter. For the five years ending March 31, 2018, the Fund’s beta was 0.50, half that of the S&P 500. For the same period, our standard deviation was 6.11% versus a S&P 500 standard deviation of 9.87%. Up Capture versus the S&P 500 for the five year period was 53.58% and down capture was 56.89%. The opinions expressed are those of the Fund’s Adviser and are not a recommendation for the purchase or sale of any security. The Standard & Poors 500 Index (S&P 500) is an index of 500 stocks. Beta is a measure of the Fund’s sensitivity to a benchmark or broad market index which has a beta of 1.00. Standard deviation is used to measure an investment’s historic volatility. The up capture and down capture ratios are statistical measures of a manager’s overall performance in upward moving and downward moving markets, respectively. We define a full-market cycle as a period of time, usually measured in years, that includes both ‘bearish’ markets (the market trends down) and ‘bullish’ markets (the market trends up).